Perennial. Zone 3. Brassicaceae (formerly Cruciferae.) Caucasus Mountains. A.k.a. COLEWORT, GIANT SEA KALE. 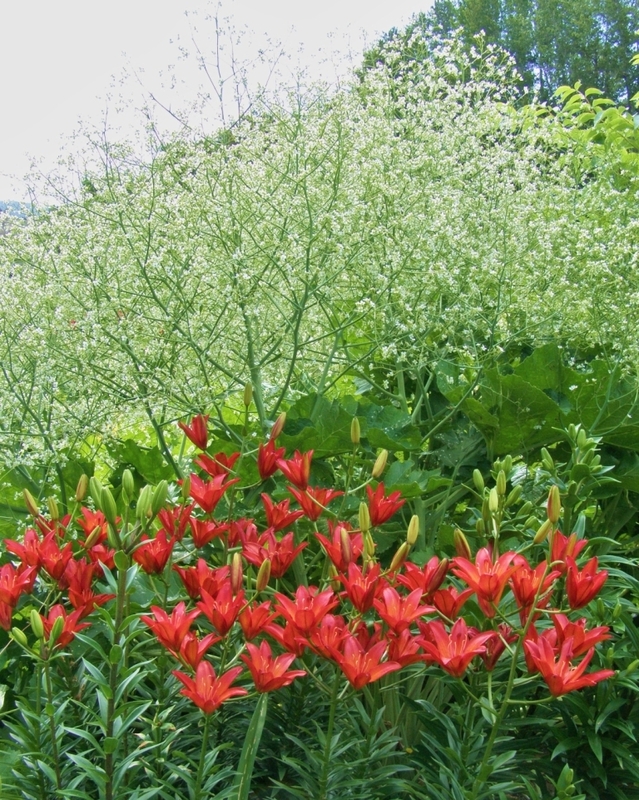 This plant has been grown in gardens for at least 100 years, and is much sought after by anyone who has seen it in the dramatic mixed perennial flower borders of famous British country estates. A most substantial plant, this is! Imagine a Volkswagen Beetle sized space commitment for its admittedly brief bloom time, 3 weeks at best. Okay, perhaps that is a slight exaggeration. But this thing can get huge. Large, thick-textured, hairy basal leaves produce tall, multi-branching stems from 3 to 6 feet tall, which produce clouds of very sweetly-scented, pure white flowers in early summer. Looks like a Baby’s Breath gone wild, is one comment a happy customer made when proudly showing me a photo of her immense 5-year-old plant. 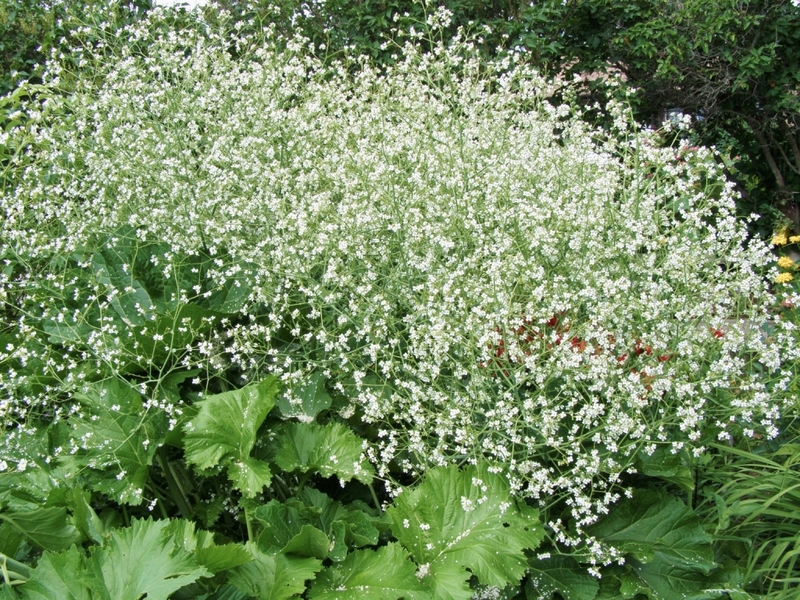 Crambe cordifolia takes a while to reach full size, usually blooming year three or thereabouts. Site carefully, as it is tap-rooted and dislikes being moved. Though not at all invasive, it may also persistently re-sprout from chunks of taproot left in the soil if you do decide to move it once it is established. Frequently the transplanted piece will languish and die, after a long, yellow-leaved decline, so think hard before getting out your shovel. Being in the Brassica Family, Crambe cordifolia is attractive to Cabbage Moths, so keep an eye out for the caterpillars, as they can skeletonize those big leaves surprisingly quickly, leaving nothing but the centre ribs. Most gardeners cut off the bloom stalks once flowering is finished, but if you want to try to ripen seed, or just simply like the look of the thing for its curiousity factor, you can certainly leave it alone, though a stake is a good idea, as summer thunderstorms may topple the aging edifice. When I first experimented with Crambe cordifolia I was rather worried about its hardiness; most Zone ratings were for 6 or thereabouts, but after almost 20 years of growing and selling it, and much customer feedback (most enthusiastic, though some people felt it got too big, or were troubled by resprouting roots after digging up established plants) I can firmly state that Zone 3 suits it just fine. Full sun. Very drought tolerant once established, though it appreciates summer moisture and reasonable fertility for the best after-blooming foliage health.